This easy blackberry cobbler recipe is full of plump berries and sweet dumplings that simmer along with a red wine blend until they come together in a thick, sweet compote. 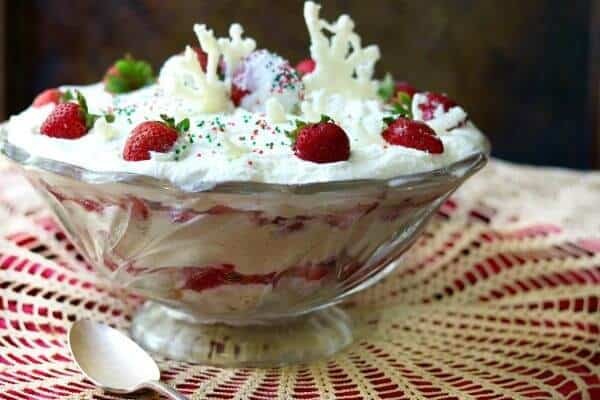 The red wine blend enhances the flavor of the berries and brings out bright flavors that keeps this classic southern dessert from being too sweet. Just add a buttery lattice top and bake to sweet perfection! This unique recipe was created in partnership with one of our favorite Restless Chipotle sponsors, CK Mondavi and Family. All opinions are my own. Say blackberry cobbler and you’ll stir up some sweet summer memories for many of us. Actually, here in Texas blackberry season is more of a late spring thing but since it’s usually 90 degrees in April I suppose you could call it summer, right? Cobbler recipes are one of those things that families in the south will go to war over. I am almost positive the whole Hatfield and McCoy feud was ignited by a vicious cobbler disagreement. Pie crust or biscuit crust…or crumble crust? Dumplings IN the filling or no? Oh honey, it gets intense! To my mind a cobbler has one flaky pie crust made with butter AND a few squares of pie crust need to be tossed in the filling as it’s simmering. The dumplings help thicken it AND they make that quintessential southern recipe stretch to feed a crowd. While the dumplings are simmering they absorb some of the flavors of the blackberries and, in this case, wine. The texture gets a little doughy and a little chewy. It’s so dang good. Being a brand ambassador for CK Mondavi and Family is one of my favorite things about my job. I mean, it’s a match made in heaven, really. They make wine… I drink wine… perfection! The make wine… I cook with wine… see a pattern? In fact, although I am absolutely positive you’ll love this blackberry cobbler, try pairing the chocolate chess pie with the Red Blend. So much perfection! Recently I had the opportunity to be part of an online tasting with Riana Mondavi. She is part of The G4 – the fourth generation of Mondavis to be officially involved in the family business. Don’t you love family owned companies with all of their realness and cute nicknames? I do. Anyway, Riana is the key spokesperson of the Mondavi G4 and she kills it! As you would expect, she really knows her wines and wine pairings but she also brings fresh ideas about pairings that make you wonder why you hadn’t thought of it yourself. We tasted three wines, Sauvignon Blanc, Chardonnay and Red Blend ( previously called Scarlet Five) and talked about fresh pairings for light and healthy spring flavors. If you want a copy of the wine pairing worksheet we used you’ll find it on their website. One of the many things I adore about this company is that they are absolutely committed to locally sourced ingredients and products. They are running a monthly “#pairNpost” sweepstakes. Instagram and Twitter followers can post a photo of their idea of the perfect CK Mondavi and Family pairing. It’s open to everyone so be sure to submit your own pairing pic! Be sure to tag your pic #pairNpost. Click through to learn more about CK Mondavi and Family. You can also follow them on social media: Facebook, Twitter, Pinterest, Instagram and YouTube. But Is THIS Cobbler Recipe Springtime Light and Healthy? Well, define light and healthy. 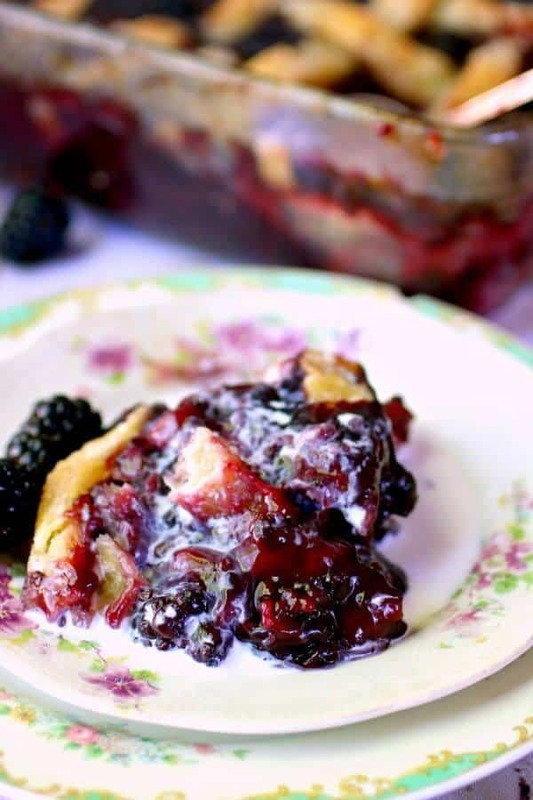 In this part of the country, where we deep fry butter and chicken-fry bacon, I’d say that this extravagantly luscious blackberry cobbler is a light and healthy dessert. It certainly pairs beautifully with the CK Mondavi and Family Red Blend wine! You see, normally I’ll add a little citrus to my blackberry filling for pies and cobblers. It balances the sweet and brings out all of the flavor. This time I decided to use the wine instead of the citrus and I promise you I won’t make it any other way ever again! The dark fruit flavors in the wine enhance the blackberries and do all the work of the citrus I was using while adding an entirely new level of flavor. Next time I’m going to reduce the water and increase the wine a bit. This is an easy recipe but there are a few little tricks to make it easier, better, or just different. Sometimes this section is called Cook’s Notes. Some people abhor pie crust on a cobbler. If you are one of them you can make this with your favorite biscuit crust and roll a bit of it real thin for the dumplings. If you are in a hurry use bought pie dough from the grocery store. If you don’t tell I won’t. 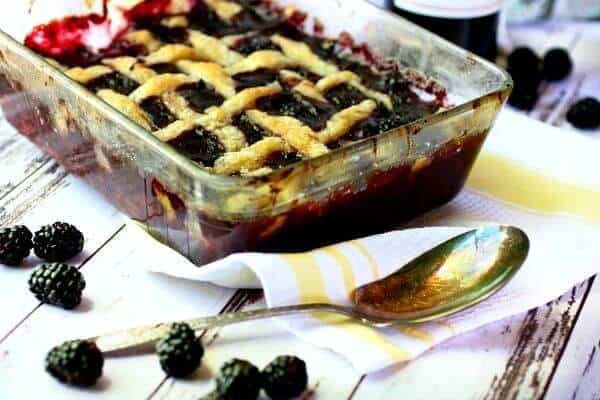 You can use frozen blackberries as well – in a pinch you can use canned pie filling. Make sure the pastry is icy cold before you try to use it. When I made this I was stopping every few minutes to take pictures and the pastry got warm so it was very hard to work with. If you want a really pretty lattice you need to get one of the ruffly edged cutters. 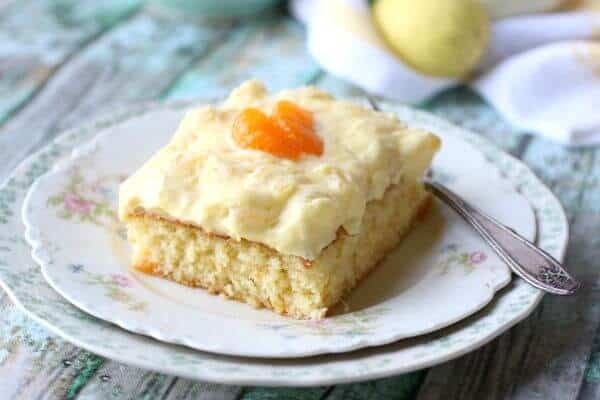 You could make this same recipe with peaches and chardonnay. This freezes well, baked or unbaked. Nice to have on hand for unexpected company! Brush some melted butter over the top of the pastry and sprinkle with sugar before baking. It gives it a delicately crumbly sugar layer that’s yum. Some people like it warm with ice cream or whipped cream. I personally like it with plain cream poured over the top. Y’all. This blackberry cobbler recipe is seriously good stuff. I had a friend that was driving down to College Station where #6 child is going to A & M and I had her take him a container of it. 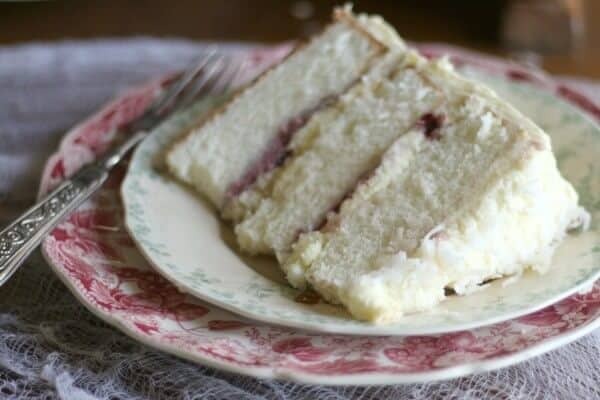 We all know there’s nothing like a little bit of mom’s homecooking now and then, right? 🙂 If you love this recipe please give it 5 stars… and… don’t forget to post it on instagram with #PairNPost @marye_restlesschipotle, ok? I love to see what you’ve made! You may also like this bourbon peach cobbler! 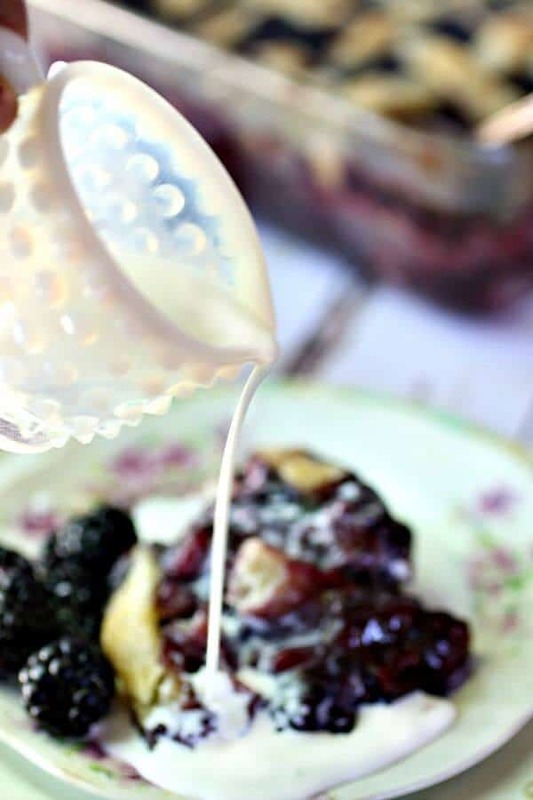 Easy blackberry cobbler recipe is southern style - full of plump berries and sweet dumplings that simmer along with red wine until they come together in a thick, sweet compote. Mix flour, sugar, and salt. Shred 12 tablespoons butter into flour with the coarse side of a grater. Add vanilla to ice water. Slowly stir ice water into the flour mixture with a fork just until dough begins to form. You'll see shreds of butter in the dough. Divide dough into 2 disks and chill for 30 minutes. Wrap tightly and place in freezer to chill prior to using. Remove pastry for cobbler crust from the freezer and roll. Cut ½" strips in both portions of the dough. Combine berries, sugar, 6 tablespoons butter, wine, and water in heavy bottomed pan and bring to a boil. In one half of the dough, cut strips again to form individual pieces for dumplings. 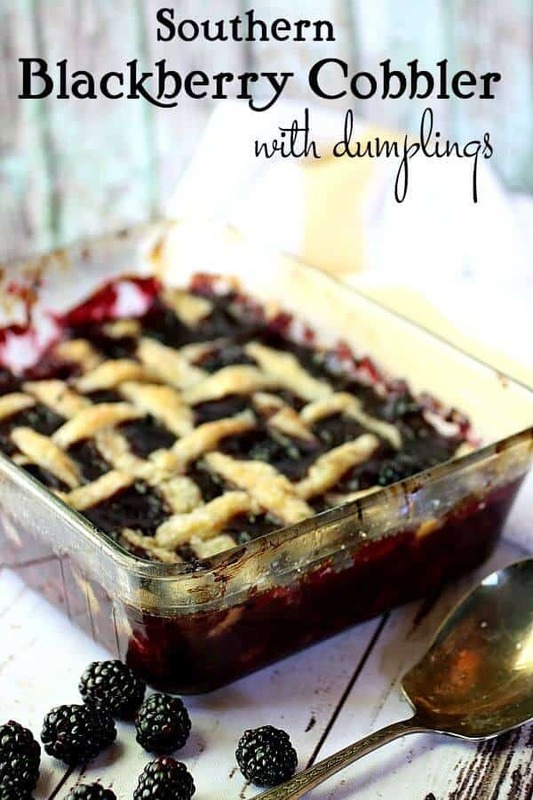 Drop into simmering blackberries and occasionally stir gently to make sure all dumplings are cooked. 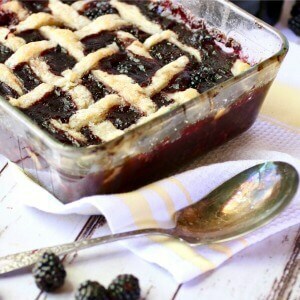 Remove cobbler pan from heat and place second half of the dough in a lattice pattern on top of the blackberries. Place pieces of butter on top of lattice crust and sprinkle with sugar. Place into oven and bake for about 20 minutes or until crust is lightly browned. You may want to use less pastry for dumplings and more on the top. Two Two Easy Peach Cobbler from This Grandma Is Fun. Peach cobbler with a cakey top made in a cast iron skillet – what’s not to love? Blueberry Cobbler with a Cookie Dough Crust from The Melrose Family. Blueberries and sugar cookie dough? Kill me now – this is perfection! 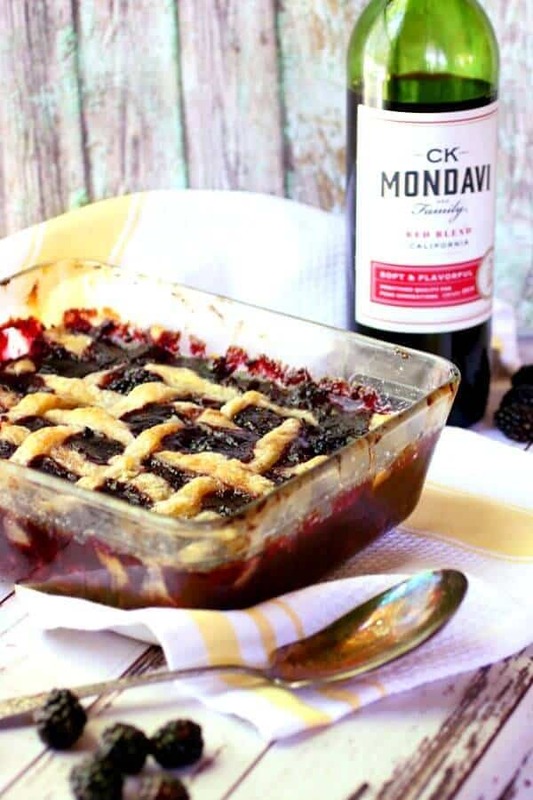 I love the addition of the CK Mondavi Red Blend in the cobbler filling. I bet it makes it much richer and added a great depth of flavor. Plus it’s then perfect to enjoy with a glass of wine! Cheers. What size cooking pan for blackberry cobbler – 9″x13″? What an incredible recipe and I LOVE that next time you will add more wine. 🙂 lol This is really beautiful and puts my mind back to my childhood days of family blackberry picking! That looks AH-MAZING!!! I can’t wait to try it!